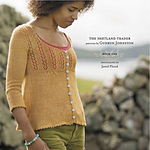 The Shetland Trader-Book One is a collection of 10 patterns inspired by the Shetland Islands from designer Gudrun Johnston with photography by Jared Flood. There is a printed and ebook version of this collection. You will automatically receive the ebook when you purchase the print edition. Scroll to bottom of page to purchase the printed version. 28 ½ (32 ½, 36 ½, 40 ½ , 44 ½ , 48 ½ ) inches/72.5 (82.5, 92.5, 103, 113, 123) cm Shown in size 28 ½/72.5 cm with approx 2 inches/5 cm negative ease. To be worn with 1-3 inches/2.5–7.5 cm of negative ease. US 4/3.5mm 32 inch circular needle US 4/3.5mm 16 inch circular needle US 5/3.75mm 16 inch circular needle US 5/3.75mm 32 inch circular needle US 6/4mm 16 inch circular needle. When working decreases in try to maintain the lace pattern when possible. If there are not enough sts to work a yarnover with it’s accompanying decrease then work the sts in stockinette st instead.